Up and Above Contractors is an expert in the installation and restoration of metal roofing systems. Metal roofs possess excellent strength, durability, and fire resistance. A versatile metal roof can imitate the look of tile, asphalt or slate, be colored in virtually any manner and is available in panels or shingles. Metal roofs New Jersey often last for 40 years or more and most come with a lifetime warranty. 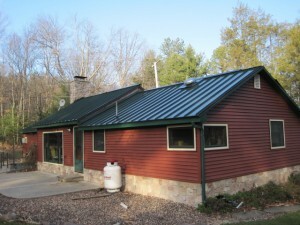 What makes a metal roof an excellent option for your New Jersey home or business? Technologically Innovative – Advances in metallurgy and installation techniques give metal roofs additional durability. Durable – Metal roofing systems carry meaningful warranties against fading, chipping, chalking, and rusting. They’ve passed wind and uplift tests including UL 580: a rigorously demanding test of roofing materials that simulates wind speeds over 120 miles per hour. Safety – Metal roofing systems lead the way in fire protection. With a metal roofing system you can rest easy knowing that your home and family are protected from deadly and destructive flames by non-combustible roofing materials. Attractive – Choose from a wide array of colors and themes that will fit your taste and style. Long-Lasting – A metal roof has a long life and gives you extra protection, plus it enhances the beauty and value of your home. Our roofing experts are happy to consult with you on the merits of metal roofing and whether it’s right for you and your home.